This week I had the opportunity to buy an old tarogato. It is an wooden instrument that is sometimes called the wooden soprano saxophone. It is used in the hunagarian and rumenian folk music. The first versions of the instrument were mentioned in the 15th century. That is why I like it. It is a piece of saxophone history. Maybe inventors of the clarinet and saxophone used ideas if the historical tarogato. Its size and conicity is about the same but its sound is completely different from the saxophone. Its sound can be very loud. But that is mainly caused by the type of mouthpiece that is used. 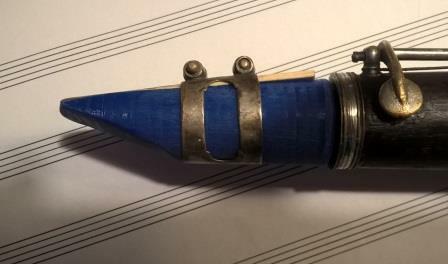 Tarogato players often make or modify their mouthpiece to create their own sound. 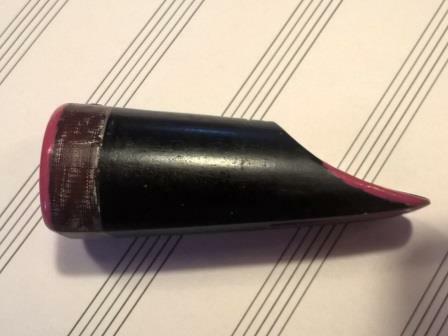 The mouthpiece that joined this instrument is on like that. Is has a very thin beak and therefore sounds very loud and it is difficult to play low notes with it. You can see that it is reshaped with some kind of pink material. Maybe nailpolish? 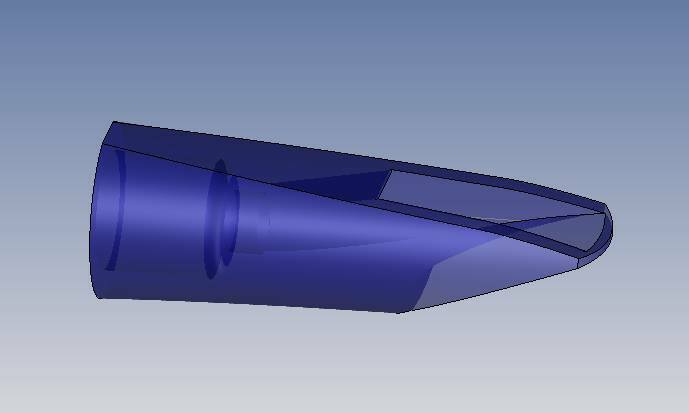 So I decide to design a new mouthpiece with the characteristics of a soprano saxophone mouthpiece. 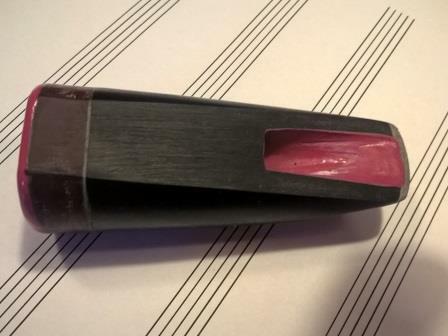 The mouthpiece is designed using Topsolid 7. 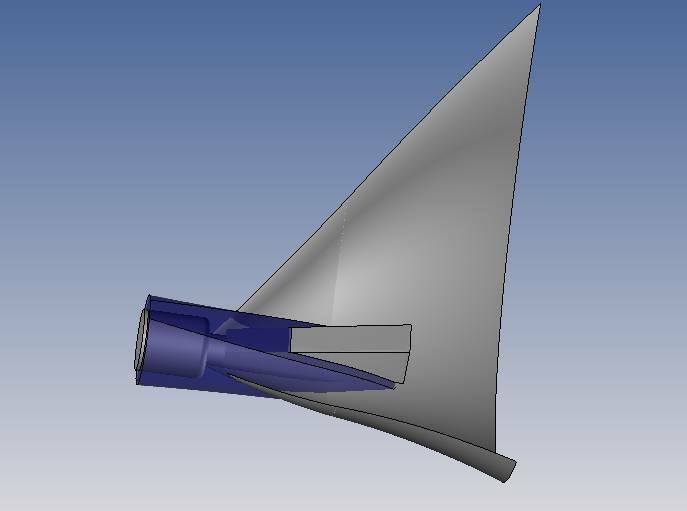 First the outside shape is made and then the bore and the chamber are made and subtracted from the outside shape. The most complex part is the curved roof of the inside shape. I needed a lot of mathematics to make that. The prototype is now printed on my 3D printer using blue PLA filament. The tarogato next to the soprano saxophone. The length is almost the same. It has rings like the clarinet. The quality of this instrument is nog very high. The rings are not perfectly rounded. There is a lot of play in the keys and the rods are not threaded. It is or a very old or a very cheap instrument. I hope it is low pitch and I think it needs some work to play well. The instrument has as most tarogato's two octave keys. Modern one sometime have an automatic octave mechanism. The result was quite nice although the 3D printed prototypes I make are quite rough. I had to sand it first with 120 waterproof sandpaper what results in a bit rough surface. It can be chemically treated to make it smoother but for prototypes I don't like to do that. 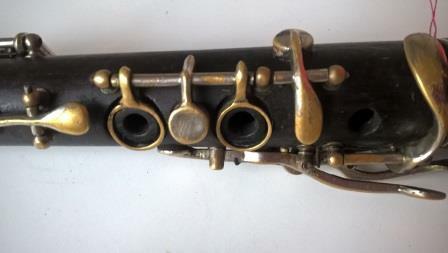 It is sufficient to test if another shape of the mouthpiece gives a better playing result. And that what it did! 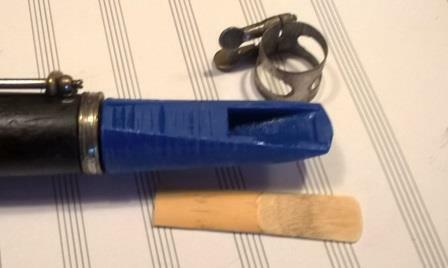 The mouthpiece gave a lot more control of the sound. It can be heared clicking this mp3 file I made from this combination. I have to warn you it is very loud!!! I think this will improve when the mouthpiece is finished properly and the instrument has had a complete overhauled and I have done some more practice.